A Rebellious Chinese Village Challenges The Authorities — Again : Parallels Five years ago, residents of Wukan got rid of corrupt local leaders and elected a new one. Now that leader has been detained for corruption, but villagers insist the charges are trumped up. Villagers wave Chinese flags and chant slogans demanding the return of their leader Lin Zulian, the Communist Party secretary of the village, during a protest on June 19 in Wukan. The protests come nearly five years after an uprising there made the village an internationally known symbol of grass-roots defiance. Back in 2011, the events in Wukan were seen as a milestone, as a small Chinese community challenged local authorities and demanded democracy, at least at the village level. The villagers' demonstrations, the government's response and a resulting compromise between the two sides were considered models that might be copied and applied to the thousands of similar local disputes that erupt across the country every year. But the resumption of protests now suggests that Wukan's underlying problems were not fixed. 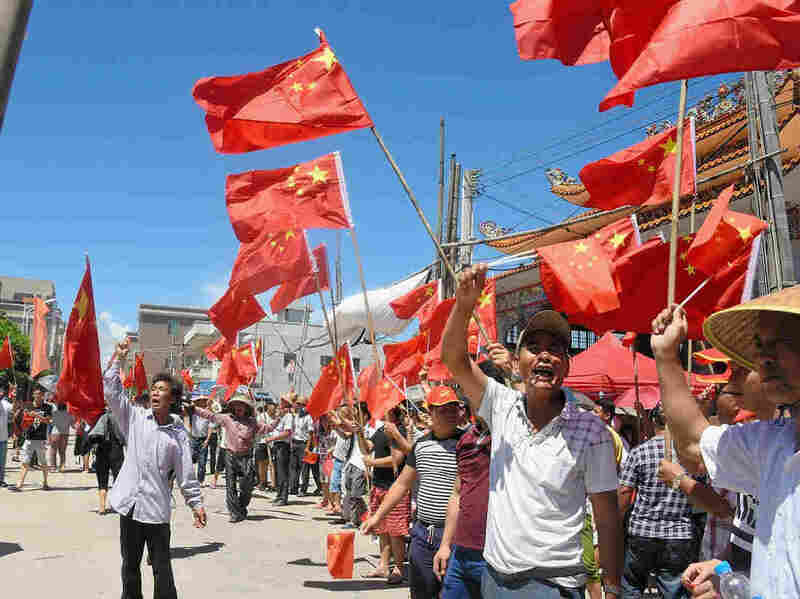 On Tuesday, hundreds of students in tracksuits and elderly residents, some in wheelchairs, carried Chinese and Communist Party flags as they marched through the village, which sits on the coast of southern Guangdong province, a few hours' drive north and east of Hong Kong. 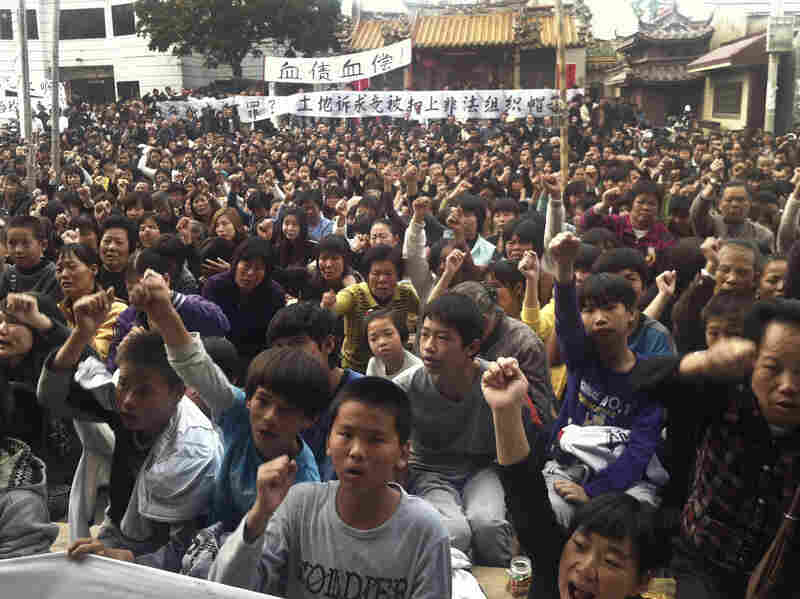 Wukan villagers, shown protesting in December 2011, chased Communist Party officials out of their hamlet and elected a new leader. Now they're protesting again. They called for the release of village chief and Communist Party secretary Lin Zulian, who was elected in 2012. State television showed footage of Lin confessing to crimes under the questioning of authorities. "Due to my ignorance of the rule of law, I took huge kickbacks for all village construction projects and purchases," he said, apparently reading his words from a script. State media report that authorities have stripped Lin of his job as party secretary. Many Wukan residents think his confession was staged and the charges trumped up. "We villagers don't believe it, because in our hearts, we think of Lin Zulian as a good party secretary," said one resident who asked that we only use her surname, Cai, as she feared government retribution for speaking to a reporter. The government has used televised confessions in many high-profile political cases, from the arrest of Hong Kong sellers of political books to public intellectuals with large social media followings. A few Chinese legal scholars have dared to criticize the practice publicly, and much of the public watches these confessions with skepticism. Most rural Chinese have been directly electing their village leaders since 1998 or earlier. But these village leaders are at the lowest level of government. They have no power to tax, and their power to resolve land disputes like those in Wukan is limited. A villager who spoke on condition of anonymity says that now, just like five years ago, protests were triggered by the actions of property developers, who took village land without compensating residents. 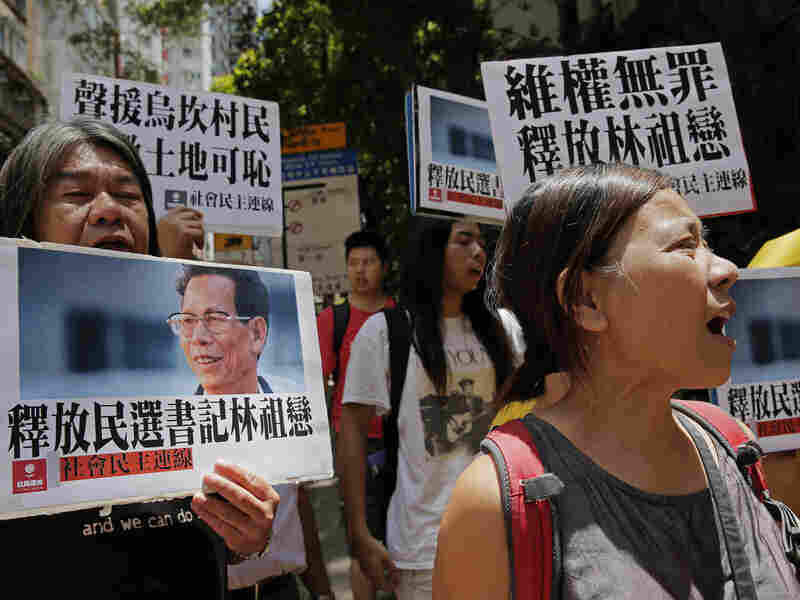 Protesters in Hong Kong hold signs saying "Release democratically elected secretary Lin Zulian," during a demonstration on Tuesday. "Secretary Lin intervened with the authorities on our behalf, but the authorities took no action," he said. "At the villagers' request, Lin called a meeting and decided to keep protesting, and as a result, he was taken away." Land grabs are a common problem in rural China, and especially in Guangdong province, where urbanization is rapidly swallowing up farmland. The land legally belongs to rural communities, but in practice, the government controls it, and local governments in China often have few sources of revenue besides selling land to developers. Nor are there many independent media or civil society groups to help rural residents get a fair deal for their land. As a result, land grabs are a contributing factor to the thousands of local protests every year. Many of them are violently suppressed by riot police. Although statistics for unrest in China are incomplete and open to interpretation, one estimate puts the number of "mass incidents" of unrest at 180,000 in 2010, of which 65 percent were related to land disputes. That's nearly 500 incidents a day, the vast majority unreported by any media. Some studies suggest that more of these incidents occur in Guangdong than in any other Chinese province. Most protests seek to resolve specific, local issues and can be triggered by concerns including pollution, corruption, urban development and human rights abuses. They seldom lead to explicit demands for political participation or regime change, nor do they coalesce into national movements. China's security forces work to keep it that way. In Wukan, as in protests elsewhere in China, many residents appeal to the country's national leaders. They argue that central government policies are good and fair, but are subverted by corrupt local officials. Five years ago, it was the provincial government that intervened and reached a compromise with Wukan villagers. The central government no doubt knew of the protests, but it is unclear if they instructed local officials on how to handle them. These days, the villagers' next move is not clear. But they say they will not act as they did five years ago, driving police and officials out of town and setting up roadblocks to keep them out. "Actually, ours is a very civilized village," insists Cai. In the past, "If we hadn't blockaded the roads, authorities would have come in and hauled people off. We were just defending ourselves." She is not optimistic that the land disputes will be resolved quickly, despite the government's promises to do so. Five years ago, authorities in Guangdong admitted mistakes. They agreed to make Wukan village financial records public and hold new elections for village leaders in 2012. The province's then-governor, Wang Yang, received credit for his deft handling of the protests, and he was promoted to vice premier in 2013. "I think it's an enlightened, informed way to face the reality," says Yawei Liu, director of the China Program at the Carter Center in Atlanta. "The villagers have legitimate concerns. They're not instigated by anyone, and particularly not by foreign forces or media" — as some Chinese officials have charged. While protests are an important way for citizens to express themselves, Liu believes that a stronger rule of law will be needed to address the underlying issues of land disputes. "I think both sides now need to be fully aware of what is at stake, assess the situation and come out with a good solution," he says.